The earthquake that rattled at least seven mid-western states on Saturday morning was a stark reminder that a new type of seismic hazard exists, which is associated with human activity. 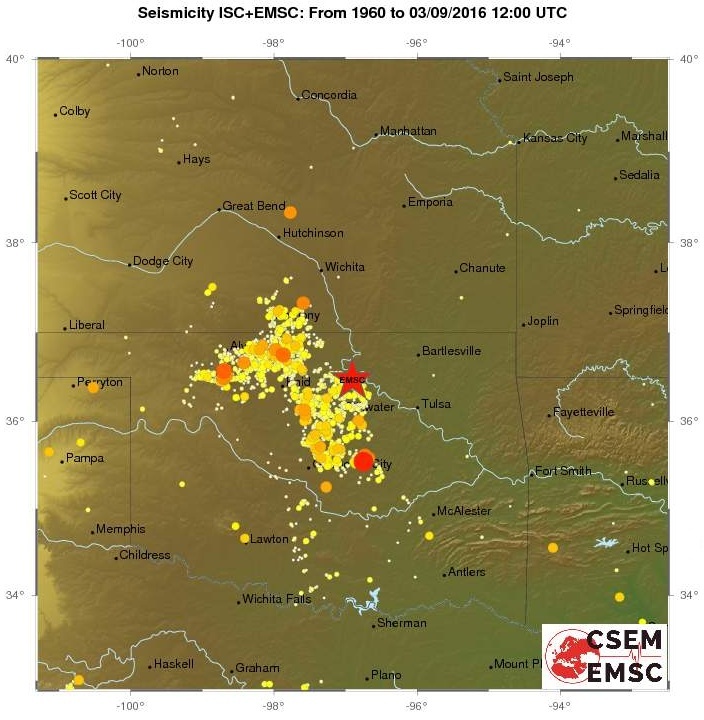 The temblor with a magnitude of 5.6 was located near the town of Pawnee, about 75 miles north-northeast of Oklahoma City. Although the quake caused only minor damage, it shook an area of the United States which - until a few years ago - was considered basically free of any significant seismic activity. But ever since an earthquake of the same magnitude struck a region immediately east of Oklahoma City in November 2011, it has become clear that a sizable seismic hazard, widely ignored until then, lurks under the oil producing states in the Midwest. 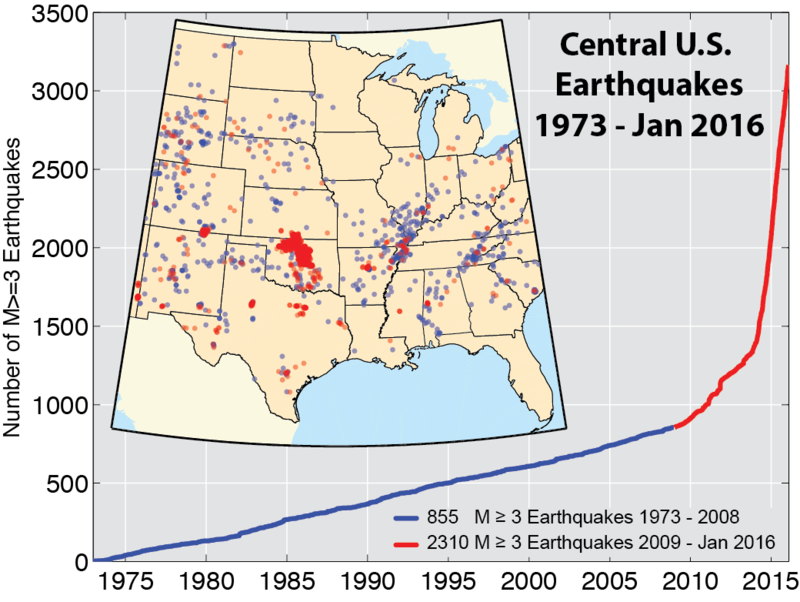 Since 2008, Oklahoma and neighboring states have seen a sharp increase in seismic activity. For many decades, the average rate of occurrence of quakes of magnitude 3 or larger in the Sooner State and beyond was about 3 per year. This rate is the natural background seismicity for the Midwest. However, the number changed dramatically about seven years ago, when the rate shot up to several hundred per year. In fact, currently more quakes with magnitude 3 or larger occur every year in Oklahoma than in California, the state with a highest rate of "natural," meaning tectonically driven seismicity. When seismologists started to study the enormous increase in earthquake activity in Oklahoma, it very quickly became clear that it was not caused by natural phenomena. Instead, the cause was human activity. The first suspect was fracking. Since the beginning of this century the oil and gas fields in Oklahoma, Kansas, Texas and elsewhere have seen a boom in this procedure, which helps improve the extraction of hydrocarbons from underground. Geologic formations are broken and cracked by injecting water under high pressure from the wellhead. Because such cracking of rocks is a process very similar to the generation of earthquakes in nature, it seemed plausible to blame the sudden increase in the seismicity rate on fracking. However, the temblors resulting from fracking are way too small to be felt by humans. Bill Ellsworth, a former seismologist at the USGS now at Stanford, summarized in the journal "Science" in 2013: "More than 100,000 wells have been subjected to fracking in recent years, and the largest induced earthquake was magnitude 3.6, which is too small to pose a serious risk." The real culprit, it turned out, also had something to do with oil and gas production. Virtually every hydrocarbon field in the world contains a significant amount of water, which is pumped to the surface together with the oil. In the United States alone, about 21 billion barrels of this so called "produced water" are generated each year from about 900,000 wells. This is equivalent to a volume of 2.4 billion gallons per day. Because this produced water contains salts, remnants of the oil and many other organic and inorganic chemicals, it cannot be flushed into regular wastewater treatment plants or even released untreated into rivers or creeks. It is simply too hazardous. To dispose of this water, it is pumped back into the ground, usually in injection wells deep below the groundwater aquifers and the oil producing formations. There are more than half a million such injection wells in the US, most of them in Texas, California, Oklahoma and Kansas. Figure 2: This hockey stick curve shows the enormous increase in seismicity for quakes with magnitudes 3 or larger in the mid-western states since 2009. While the great majority of these wells are operated without any problems, some wells, particularly in Oklahoma, have become very problematic. These wells reach more than 7000 feet deep below the surface into the Arbuckle formation, a roughly 500 million year old layer of limestone. It lies right above the crystalline basement rocks. Once large amounts of waste water are pressed into the Arbuckle formation, the pore pressure in this formation as well as in the basement rocks increases. This in turn can activate earthquake faults deep in the basement, which have been dormant for millions of years. The hypocenters of most of the recent quakes in Oklahoma seem to lie on such slumbering, hitherto unknown faults. Once seismologists established this cause and effect relationship, mid-western states started to change their regulations on operating wasterwater injection wells. Until recently, most regulations made sure that the wastewater did not come into contact with groundwater to avoid any contamination. This summer, however, the regulatory agencies in Oklahoma and Kansas have started to limit the daily volume of wastewater injection into those Arbuckle wells.